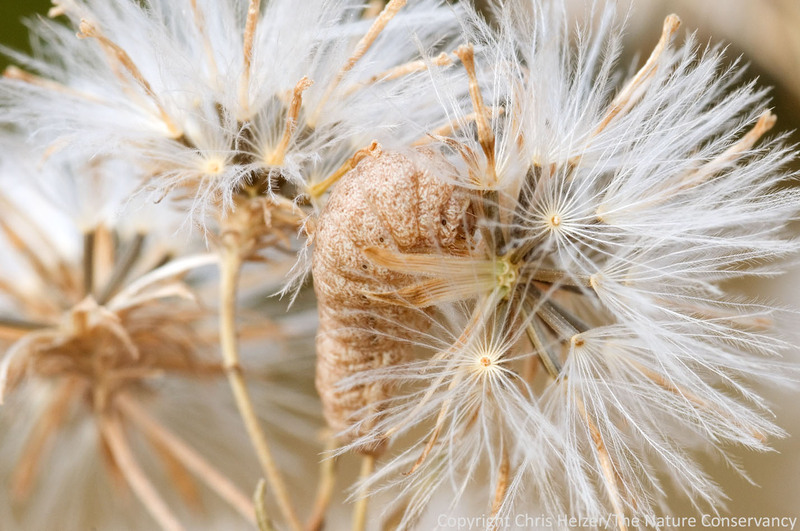 In last week’s Photo of the Week post, I mentioned that I’d spent part of a morning photographing white fluffy seeds in autumn prairie. (It’s not a bad life, all things considered.) As I walked that morning, I noticed how quiet it was. In fact, the only sounds I heard were those of my feet crunching through the dried grass. We’ve had three below-freezing nights in the last week or so (25, 27, and 28 degrees F), and those cold temperatures have eliminated most insects – and their sounds – from the prairie. 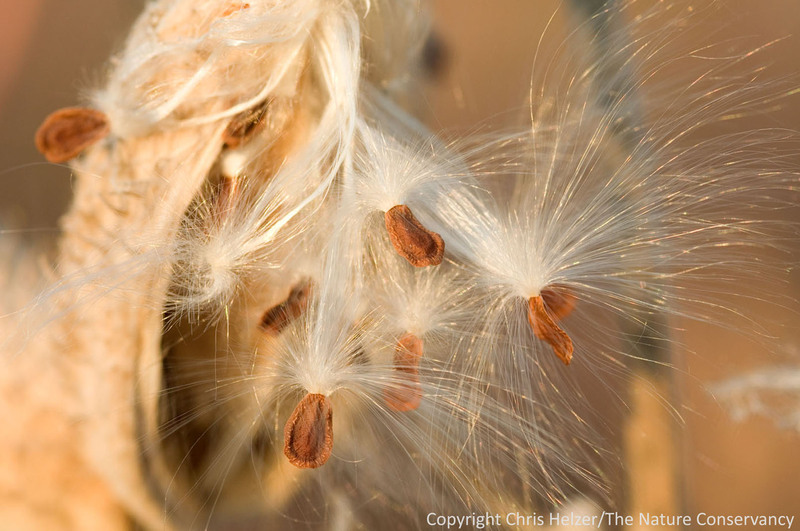 Milkweed seeds in autumn prairie. However, the prairie was not completely devoid of insects. As I was photographing seed heads of false boneset (Brickellia eupatorioides), I noticed that one of the flower stems seemed much thicker than it should have been. Upon closer inspection, it turned out to be a caterpillar. Anyone know what kind it is? I certainly don’t. 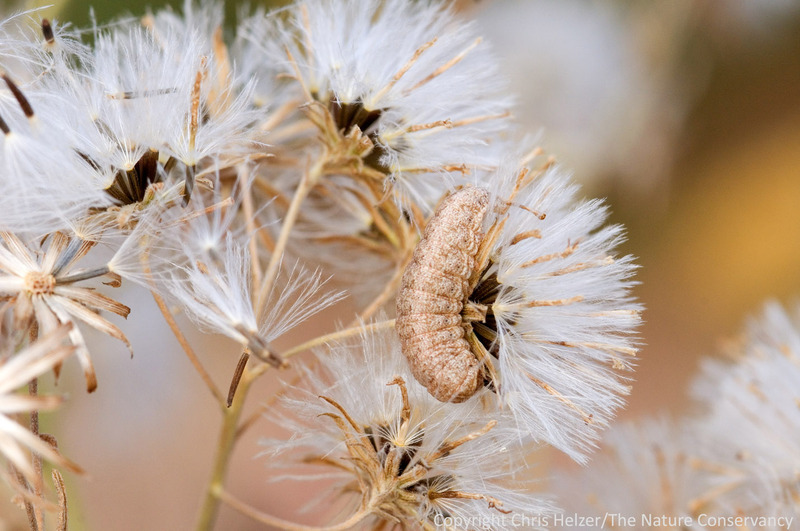 A caterpillar on a false boneset seed head. In fact, there were two caterpillars on the same plant. Did they survive the cold temperatures right there on the plant? Or did they drop down into the thick leaf litter below during those frigid nights and find enough warmth to avoid freezing? Are they larvae of a moth that overwinters as a caterpillar? Or are they the last reproductive gasp of a moth species that migrates north each year in the spring, produces multiple generations, and then finally succumbs to the winter cold? A second caterpillar on the same plant. The coloration of the caterpillars matches fall prairie foliage very well, which makes me wonder whether they are of a species that overwinters as a caterpillar – and has protective coloration to match late fall dormant stems. Maybe one of you will know some of the answers to my questions and can solve the mystery. That’d be great, but in the meantime, it’s just as much fun to speculate as to know! The caterpillars weren’t the only insects in the prairie. Just a few steps away, I found the insect pictured below. Can you identify it from the front? Do you recognize the face of this insect? The photo below gives you a better look. 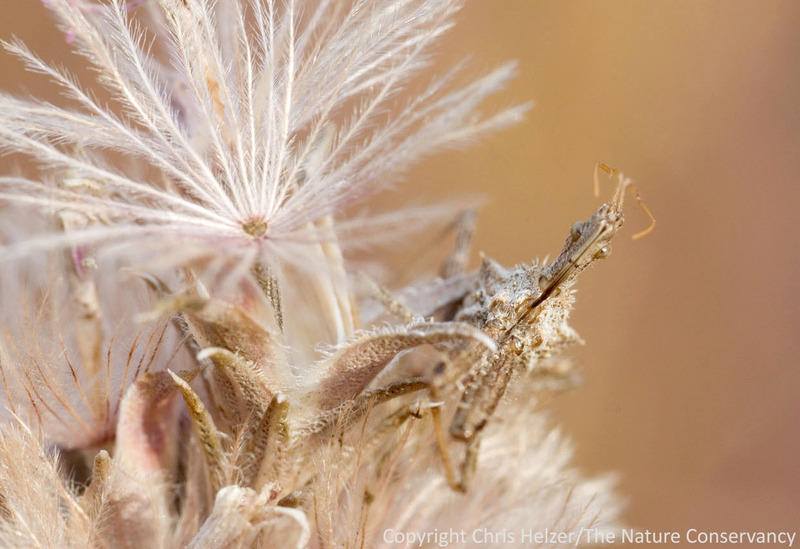 An assassin bug sits in ambush on the seed head of a dotted gayfeather plant. The assassin bug appeared to be waiting quietly for another insect to venture near enough to become a meal. Based on the scarcity of insects in the post-hard-freeze-prairie, that could be a long wait. Besides the assassin bug and the two caterpillars, the only other insect I saw was a ladybug, though I’m sure there were others that survived the first cold snaps – including wolf spiders. Long-time blog readers might remember a post from a couple years ago about a wolf spider I found running around on the ice on an 18 degree F day. Well, a good hard freeze does bring death to lots of insects. However, their species show up again the next year, so they clearly have strategies for getting through the winter. Many species overwinter as eggs, but others survive as larvae or even adults. Most of those that overwinter as larvae or adults seek shelter from the worst of the cold by burrowing underground or beneath deep leaf litter. Even so, they may have to withstand temperatures well below freezing. Some insects produce a kind of anti-freeze solution to protect themselves from freezing, while others change the way they store liquids within and between their cells so their cells don’t rupture when those liquids freeze and expand. …and of course there are lots of other strategies. You can read a technical description of some of those in this research article, if you’re interested. Or you could read a more general post I wrote last year about winter survival strategies of a number of animals. 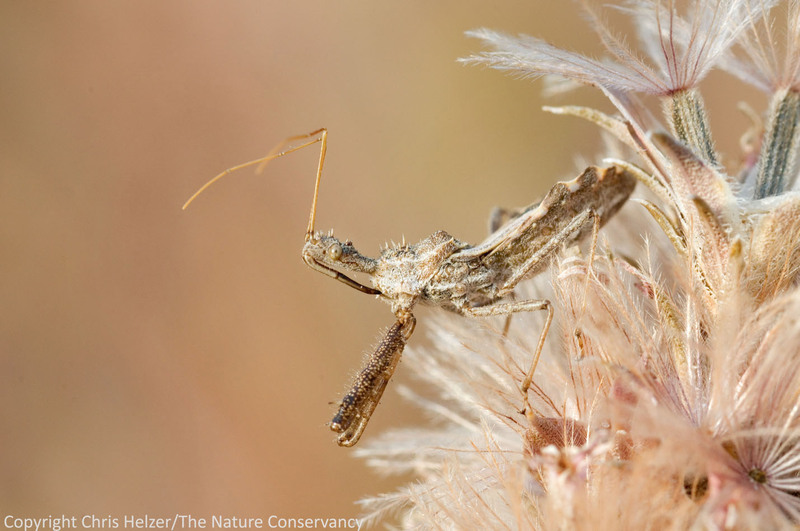 What’s happening to the insects in prairies near you? Have you already seen the big first freeze die off? Maybe you live in a climate where that never happens? I’d love to hear your stories. This entry was posted in General, Prairie Insects, Prairie Natural History, Prairie Photography, Prairie Plants and tagged antifreeze, assassin bug, caterpillar, cold weather, diapause, dormant, freeze, grassland, insects, invertebrates, overwinter, prairie, seeds, winter by Chris Helzer. Bookmark the permalink. Mosquitoes, solitary wasps, colonial wasps, ants and all other species are still quite active here in Central TX. The monarchs are ending their push through right now. They were hitting the Greg’s mistflower and Liatris mucronata in my flower beds earlier last week. Last winter I found a monarch caterpillar on an Antelope-horn milkweed plant munching away on New Year’s Day. So I’m assuming some years it doesn’t even get cold enough to matter much to our insect life. We’ll hear crickets and other things all winter. It’s a once every 2-3 yr event for it to drop below 20 degrees here, and that will usually occur only once a season. Envious. I like winter less and less as the years pass. The caterpillar looks like something in the Schinia genus. Another wonderful post and neat photos. Your camera not only makes you a careful observer, but it also spurs you to ask even more questions. As a fellow photographer and teacher, I admire both of those propensities. In forests, I have seen immobile insects present in the leaf litter immediately after snow melt. I expect some prairie insects over winter using the same method. They just stay frozen under snow until it thaws and warms. I can’t help with the identification, but it sure does seem to match the color of the plant. I don’t think I’ve seen any assassin bugs in my S.E. Nebraska yard, but even after the 22 degrees, there have been lots of bees, and a few painted ladies and skippers around enjoying the goldenrods and asters. Hmmm, that caterpillar could be in the dingy cutworm complex (Feltia jaculifera). You could post it on bugguide.net if you want a more informed identification.